Dental implants offer an excellent alternative to bridges and dentures when it comes to replacing your missing teeth. Our Menai dentist, Dr Stephen Suster offers comprehensive implant therapy right here in our office. Unlike other types of dental restorations, implants are extremely beneficial to the health of your surrounding teeth and bone structure. By nature, the implant encourages new bone growth, which secures the artificial tooth permanently into the jaw, just like a real tooth. In turn, this prevents the usual bone shrinkage seen in areas of tooth loss and subsequent shifting of your adjacent teeth. 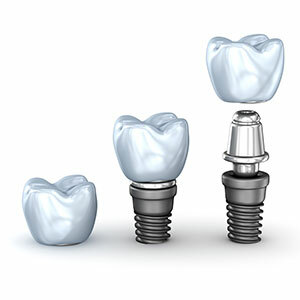 An implant is an artificial tooth root that is made of titanium and inserted at the area of your missing tooth. Because they are extremely strong, the implant can support a customised crown, or be paired with other implants to support bridges or even dentures. The end result mimics the appearance of a natural tooth. Compared to conventional treatments, dental implants have the longest life expectancy of all modern dental procedures. The implant process is an affordable way to replace multiple missing teeth for life. Vision Dental works with a surgeon who specialises in implants to perform your entire procedure right here in our Menai clinic. After being placed, a cap covers the implant for several months as the bone heals. Next, we take an impression of your implant to create your fixed prosthesis in a lab. Once it is ready, your healing abutment is removed and the crown, bridge or denture is fixed into place. Schedule a consultation at Vision Dental to find out. Dr Stephen Suster is happy to discuss your concerns, options and choices like sleep dentistry to ensure a positive experience. Contact us today and be sure to ask about our 0% interest free financing plans.